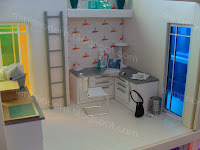 I especially like the minimal modern dollhouse inside this miniature scene. Hello and thanks! The doll house is the Kaleidoscope House by Bozart Toys. The Chair comes from Reac Japan. 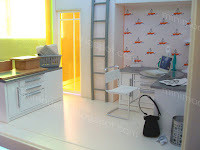 The table components are from a Streets Ahead Dollhouse kitchen set. The accessories come from Kaleidoscope House accessories, AG Minis, Irwin and Muji. The eye glasses and purse come from action figure sets.